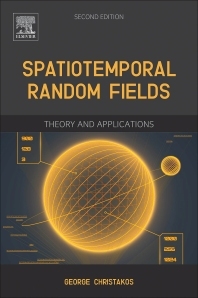 Spatiotemporal Random Fields: Theory and Applications, Second Edition, provides readers with a new and updated edition of the text that explores the application of spatiotemporal random field models to problems in ocean, earth, and atmospheric sciences, spatiotemporal statistics, and geostatistics, among others. The new edition features considerable detail of spatiotemporal random field theory, including ordinary and generalized models, as well as space-time homostationary, isostationary and hetrogeneous approaches. Presenting new theoretical and applied results, with particular emphasis on space-time determination and interpretation, spatiotemporal analysis and modeling, random field geometry, random functionals, probability law, and covariance construction techniques, this book highlights the key role of space-time metrics, the physical interpretation of stochastic differential equations, higher-order space-time variability functions, the validity of major theoretical assumptions in real-world practice (covariance positive-definiteness, metric-adequacy etc. ), and the emergence of interdisciplinary phenomena in conditions of multi-sourced real-world uncertainty. George Christakos is a Professor in the Department of Geography at San Diego State University (USA) and in the Institute of Island & Coastal Ecosystems, Ocean College at Zhejiang University (China). He is an expert in spatiotemporal random field modeling of natural systems, and his teaching and research focus on the integrative analysis of natural phenomena; spatiotemporal random field theory; uncertainty assessment; pollution monitoring and control; human exposure risk and environmental health; space-time statistics and geostatistics.